"Health & Fitness should be for everybody, irrespective of your physical capabilities" - Dom Thorpe, founder Disability Training. Here at Disability Training our aim is to provide quality personal training for disabled people. We look beyond your disability, and at you as an individual. If you're looking for a personal trainer who specializes in working with disabled people, or if you have a disability and you're looking to get fit, you're in the right place. 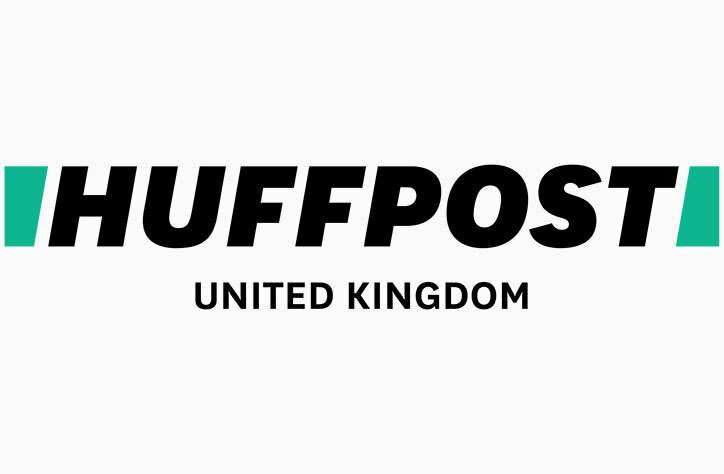 We find out what you CAN do and apply all the rules of health and fitness in ways which work with our clients. We love to encourage people to start working out with their disabilities. We're not here to “cure” or “fix” your disability. That's not what Disability Training is about. We're here to help you exercise in spite of your disability. Often as a result of this, we’ll see an improvement in your strength, balance, coordination, body composition and general physical ability. We’ll travel to your home or gym facility and take you through a structured routine based on you and your body. There IS no rule book. We had to throw it out the window a long time ago. Each and every disability has its own quirks and hurdles. Each and every person with a specific disability can vary massively in their level of ability or symptoms, so we can’t simply use a pre-written programme. We have to carefully consider, adapt and create bespoke exercises to suit you, in order to get the most from our sessions together. 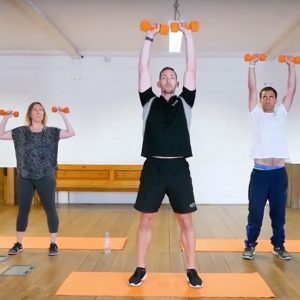 I'm currently the featured fitness instructor for the exercise videos provided by The MS Society where you can find multiple workout videos which can be done in the home. 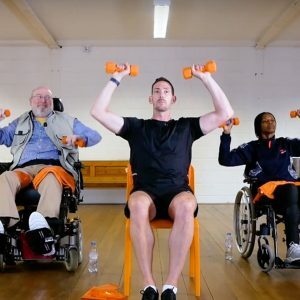 The latest fitness program from Dom Thorpe, the personal trainer who specializes in working with Multiple Sclerosis. If you have MS and you’re looking to get fit, you’re in the right place. Here's a few testimonials from clients with a wide range of disabilities. Instead of feeling down, tired, my muscles wasting away, I was back! Exercise makes you feel good, really good about yourself, not only in body but just as important in mind as well. I did not feel like a second class citizen any more. 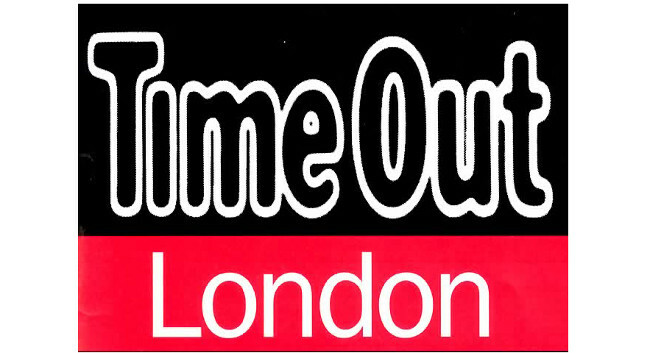 Dom treated me – most of the time – like all his able bodied clients, no soft regime for me. That made me feel normal. We also laughed a lot, so important when the going is tough. Dom is one of the best personal trainers/motivators I have encountered. He has continuously motivated me even during periods of illness. 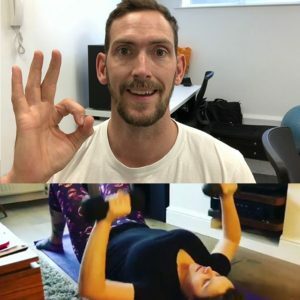 I suffer from multiple sclerosis and now a brain tumour, however he keeps me motivated and I’ve lost over 20kg following both his lifestyle tips and through training sessions with him. He also has helped me achieve my goal of actually being able to walk great distances and attend Notting Hill carnival on both days, despite my physical limitations. He is just generally an incredible motivator and pushes me that little bit further each time until I feel good in myself. Dom has a way of adapting the exercises to work around my disability. I had difficulty doing squats because of my balance. He suggested I hold on to something, it could be a chair, handrails or bed and then do them, it. I found doing sit ups really difficult because I have weak stomach muscles and my feet have a tendency to slide. Instead of having to rely on someone holding my feet in place I asked Dom if there was something I could buy to keep my feet from sliding, he advised using a sit up bar which attaches to the door and your feet are secure in place, this made doing the exercise easier. Dom’s method of teaching is unique and I would highly recommend him to anyone who wants some personal training.